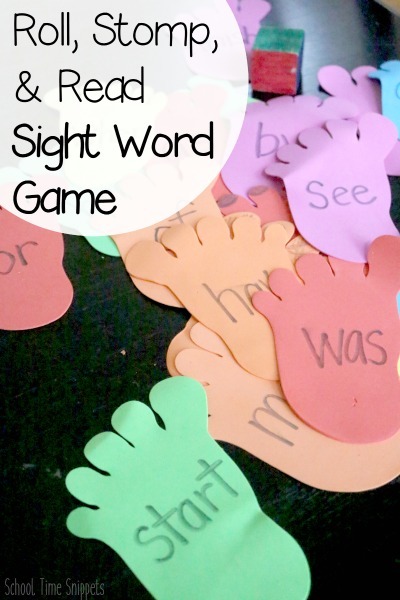 Get moving and reading with our latest sight word game! You may remember these colorful foam feet from our Stomp & Read phonics game, and I set them out again to work on several sight words with Big Sis. Roll, Stomp, & Read is a fun gross motor game as your child will roll the die, move that many spaces, and read the word. This takes simple sit down board games up a notch! After playing a couple of times, my daughter joyfully explained, "I love this game!" Yes! Educational win for mom! 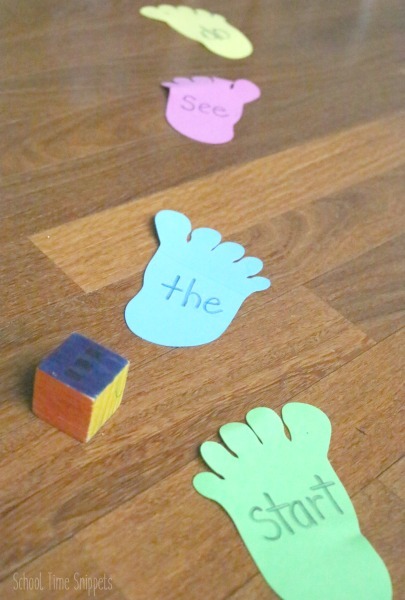 Going on a Name Hunt Post It Notes Game or for older kiddos, Go on a Noun Hunt! On each foam foot write out various sight words your child has been working on. This activity could also be used for CVC or CVCC words, too. Grab a numbered die or you could use a wooden block and color each side a color that matches a foam foot. It just so happened that our colored die from our Clothespin Color Game worked perfectly for this as our numbered die was MIA. The colored die made gave this game a similar feel to our beloved CandyLand board game. To play is simple: roll the die, move and/or stomp that many spaces, and read the word. If you read the word correctly, you may stay in that spot. If you read the word incorrectly, you must move back to where you were. Continue until you reach the word "Finish!" As I mentioned above, my daughter loved this simple reading game! She worked on her reading skills and had fun, too!! Woo-hoo!